Space-like adjectives are often used to describe bitcoin’s stratospheric price rise. Now there may be some truth in those analogies. Blockstream Inc. plans to make the digital ledger underpinning the cryptocurrency accessible via satellite signal so people without Internet access, or in places where bandwidth is expensive, can trade and mine bitcoin. The company also touts the service as additional layer of reliability for bitcoin’s blockchain data in the event of a network disruption. 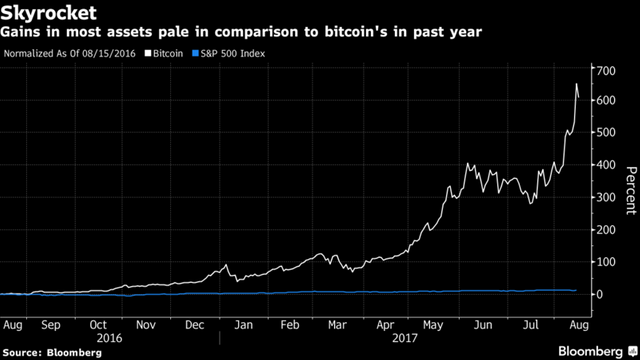 Bitcoin has soared more than 50 percent since the start of the month. A plan to move some data off the main network was activated last week in an effort to quicken trade execution and broaden access, helping to fuel the optimism. The price climbed to a record $4,449.90 Tuesday before retreating. “With more users accessing the bitcoin blockchain with the free broadcast from Blockstream Satellite, we expect the global reach to drive more adoption and use cases for bitcoin, while strengthening the overall robustness of the network,” Blockstream co-founder Adam Back wrote in an e-mailed statement. Ground stations, called teleports, will uplink the public bitcoin blockchain data to the satellites in the network, which then broadcast the data to large areas across the globe, the company said.